Based on the novel by Jose Giovanni, Le deuxieme soufflé is the story of an escaped criminal who chooses to embark on one final job while being pursued by a police inspector. Written for the screen and directed by Jean-Pierre Melville, the film is the study of a man trying to escape the world of crime only to be pulled back in as he is also aware that an inspector is looking for him. Starring Lino Ventura, Paul Meurisse, Raymond Pellegrin, Christine Fabrega, and Pierre Zimmer. Le deuxieme soufflé is a riveting and evocative film from Jean-Pierre Melville. The film follows a revered criminal who escapes prison as he hides from the authorities where he is given a job offer to steal platinum bars for a crime boss and in return can retire. That is pretty much the film’s plot as a whole yet there is so much that happens as it play into the ideas of loyalty and intrigue where this criminal is also being pursued by this police inspector who knows what the man is up to. Jean-Pierre Melville’s screenplay opens with Gustave “Gu” Minda (Lino Ventura) making his escape with two other men as he is given some money and a place to hide but also wants to see his sister Manouche (Christine Fabrega) and her loyal bodyguard Alban (Michel Constantin) who would help out though they’re aware that several people are trying to find Gu including the famed police inspector in Blot (Paul Meurisse). The film’s script does play into this cat-and-mouse game that Blot and Gu are playing with the former trying to figure out what Gu is doing with the latter accepting this job from the crime boss Paul Ricci (Raymond Pellegrin) with three other men to steal a shipment of platinum bars. Yet, Melville is aware that everything leads up to this heist in the middle of the film but it’s the aftermath that is more interesting. Notably into the idea of loyalty and honor which is something Gu holds dearly as he and the team of men in the heist already have plans to split the take five-ways but something goes wrong early in the third act when Gu is suddenly arrested by another police inspector in Fardiano (Paul Frankeur) who would trick Gu into unveiling information. For Blot, he sees Fardiano’s methods as inhumane leading to more trouble with Gu becoming a big target for all involved. Melville’s direction is definitely rapturous in the way he creates this world of the French criminal underworld as it is shot partially in Paris and Marseilles with many of the interiors shot in a studio set in Paris. Yet, it opens with this escape scene where Gu and two men look out for guards as they climb over the walls and later ride a train. Melville’s usage of wide shots play into the location including the film’s big heist scene at the mountain roads. The attention to detail that Melville puts in where the characters are at and where to be positioned for the heist show that idea of professionalism of what it takes for a heist to succeed. It’s among the big sequences that Melville has made in a film that is largely intimate in the way characters deal or interact with each other in the usage of close-ups and medium shots. Particularly in the cramped and small apartment that Gu lives in where he would have a dinner with Manouche and hide out there hoping to go to Italy. There are also these entrancing images at the nightclub that the Ricci brothers own that often feature these gorgeous dancers as it play into this world that the Ricci brothers are trying to run and maintain. Much of the film’s first act has Melville maintain that intimacy and exploration into the criminal underworld as well as establishing Gu’s reputation within the underworld which is why Paul Ricci wants him for the job. When the film reaches its third act, it’s not just about the code of the criminal that gets broken but also the impact of that code being broken. Especially as Gu is someone who doesn’t like to inform on anyone and it is that reputation that is dear to him where he starts to fall apart once he’s being tricked. These moments in the third act where it is clear that something is off prompts one of Gu’s associates in Orloff (Pierre Zimmer) to figure out what to do to prove Gu’s innocence but is also tasked to do something else in case Gu is really guilty. All of which play into this idea of loyalty and honor in the world of crime with Blot trying to pursue Gu and bring him to justice. Overall, Melville crafts an intense yet ravishing film about an escaped criminal doing one final job only for things to go wrong in its aftermath. Cinematographer Marcel Combes does brilliant work with the film’s black-and-white cinematography with the usage of low-key lights for many of the interior/exterior scenes set at night along with some vibrant natural lighting for some exterior scenes in the daytime. Editors Monique Bonnot and Michele Boehm do amazing work in the editing with its usage of jump-cuts, transition wipes, and fade-outs to help structure the story and play into the suspense. Production designer Jean-Jacques Fabre and set decorator Guy Maguin do excellent work with the look of Gu’s small apartment as well as the club that the Riccis run and the interiors of Manouche’s boathouse. Costume designer Michel Tellin does fantastic work with the look of the suits the men wear as it does play into the style of film noir and gangster films as well as the lavish dresses that Manouche wears. Sound mixer Alex Pront does superb work with the sound as it play into the atmosphere of the locations with some heightened sounds in the mixing for some places along with the film’s big heist sequence. The film’s music by Bernard Gerard is incredible for its jazz-based score that play into the liveliness of the film as well as the underworld and in some intense moments in the film. The film’s wonderful cast include some notable small roles from Pierre Grasset and Denis Manuel as a couple of criminals who took part in the heist as they later want to kill Gu for breaking the code, Michel Constantin as Manouche’s bodyguard Alban who is also a former marksman, Marcel Bozzuffi as Paul’s brother Jo who wants Gu dead, and Paul Frankeur in a terrific performance as the corrupt police inspector Fardiano who would use dirty tactics to capture Gu. Pierre Zimmer is superb as Gu’s friend Orloff as a man who acts as a middle-man for Gu and Paul Ricci as he is a no-nonsense man that makes sure things go well while he becomes suspicious of Jo’s intentions later in the film. Christine Fabrega is excellent as Gu’s sister Manouche as a woman who has money and is willing to help out her brother while trying to evade questions from Blot. Raymond Pellegrin is fantastic as Paul Ricci as a crime boss who wants Gu to do a heist for him as he is also willing to give Gu the chance to leave the life of crime until things go wrong in the aftermath. Paul Meurisse is incredible as Inspector Blot as a no-nonsense police inspector who is eager to capture Gu while wanting to ensure that Gu is brought to justice without any harm as he’s a man that also plays by a code and honor as he knows that some in the police can’t be relied on. Finally, there’s Lino Ventura in a phenomenal performance as Gusatve “Gu” Minda as this criminal who lives by a code of honor among thieves where he does his job and keeps his mouth shut where he would escape and get a chance to do a final job. It’s a performance that has Ventura be cool and not show much emotion except in the third act when he’s being accused of being a rat which pisses him off big time as it is a must-see performance from Ventura. 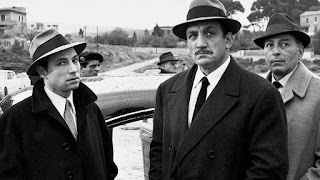 Le deuxieme soufflé is a tremendous film from Jean-Pierre Melville that include great performances from Lino Ventura and Paul Meurisse. Along with its supporting cast, gorgeous visuals, playful score, and themes of honor and ideals in the world of crime. It’s a film that play into men planning a heist only for things to go wrong in its aftermath as it showcases not just the fallacies of loyalty but also in the fact that there’s no one to trust in the world of crime. In the end, Le deuxieme soufflé is a spectacular film from Jean-Pierre Melville. You're always watching all these older films I've never heard of and they all sound so lovely. I need to go backwards more often. This is why I love what I do. To find something that many people haven't seen or heard and just seek it out and hope to get everyone to check it out. Plus, this was a Melville film as I knew I had to record it. It is slow in its pacing but it is worth getting invested in to see how professional these guys are as everyone who loves film has to check out the works of Jean-Pierre Melville. Check out Alex's post on Melville as he has pretty much done a good profile on the man and the films he's seen from him so far as there are still a couple that are extremely hard to find.